Acute kidney injury (AKI) is typically diagnosed by a progressive rise in serum creatinine over several days, which may or may not be associated with oliguria. Changes in serum creatinine lag several days behind actual changes in GFR, and the alterations in serum creatinine are not particularly sensitive or specific for small changes in GFR. The detection of a reliable biomarker for early diagnosis of AKI would assist in facilitating early intervention, evaluating the effectiveness of the therapeutic intervention, and guiding pharmaceutical development (1,2). Using caspase-1–deficient mice and anti–IL-18 antiserum, we demonstrated that IL-18 mediates ischemic acute tubular necrosis in mice (3,4). These preclinical observations suggested that IL-18 in the urine has the potential to serve as a biomarker for AKI in humans. To evaluate this hypothesis, we performed a cross-sectional study in humans and measured urine IL-18 in patients with established AKI and other kidney diseases (5). Urine IL-18 levels were significantly increased in patients with AKI compared with prerenal azotemia, urinary tract infection, chronic renal insufficiency, and nephrotic syndrome. Urinary IL-18 levels had sensitivity and specificity of >90% for diagnosis of established AKI in humans (5). Acute lung injury (ALI) and its more severe form, acute respiratory distress syndrome (ARDS), are common diagnoses in the intensive care unit (ICU) and are commonly associated with AKI. The objective of this study was to determine whether urine IL-18 is an early marker of AKI in the ICU in patients with ALI. This study used the urine that was collected prospectively in patients who were enrolled in the National Institutes of Health–sponsored ARDS Network trials. Our study was performed on a subset of patients who were enrolled from March 1996 to March 1999 in the National Institutes of Health–sponsored ARDS trial of lower versus higher tidal volume ventilation in ARDS and ALI (6,7). The inclusion and exclusion criteria for these studies were reported previously (6,7). As part of the protocol, urine samples were collected on study days 0, 1, and 3. The urine samples were centrifuged and frozen at −70°C. Among 861 patients of the ARDS Network trial, 617 had at least two urine specimens collected as part of the study protocol, and of these, we excluded 285 patients with baseline creatinine measurements >1.2 mg/dl. From the remaining 332 patients, those who had and at least a 50% increase in serum creatinine occurring within the first 6 d of ARDS study enrollment were selected. The cases of AKI were classified into six groups (1 to 6) on the basis of the study day when the creatinine first increased by at least 50%. A total of 52 patients were available, with 11, 15, three, seven, seven, and nine who developed AKI from days 1 to 6, respectively. Two control patients were randomly selected for every case of AKI on each day from patients who had survived until that day. Because of the considerable number of deaths in the patients with ALI, the selection of control patients by this method prevented “survivor bias” by reducing the oversampling of survivors. As some patients were randomly chosen more than once as control patients, there were 86 control patients available for the 52 case patients in our study. Altogether, 400 samples of urine were available from case patients and control subjects. The urine was centrifuged, and the supernatant was used for biochemical measurements. Specimens were randomly ordered for biochemical analysis, and personnel who were blinded to case patients and control subjects performed the biochemical assays. IL-18 was measured in human urine using a human IL-18 ELISA kit (Medical and Biologic Laboratories, Nagoya, Japan) that specifically detects the mature form of IL-18 (8). The specificity of this kit for mature IL-18 was confirmed as follows: Recombinant human pro–IL-18 (R & D Systems, Minneapolis, MN) was assayed using the human IL-18 ELISA kit. One nanogram per milliliter of pro–IL-18 was detected as 10 pg/ml mature IL-18. Thus, cross-reactivity of the kit for pro–IL-18 is extremely low (3,5). The coefficient of variation of interassay and intra-assay reproducibility for IL-18 concentration ranges from 5 to 10% in our laboratory and corresponds to that reported by the kit manufacturer. The measurements were also repeated on 10% of the randomly chosen samples to confirm the reliability of IL-18 results in this study. Urine creatinine was measured by using Jaffe’s colorimetric method (Alkaline Picrate). Urine sodium was performed using the Indirect Ion Selective Electrode method. Both of these tests were performed on a Beckman-Coulter LXi725. The intra-assay and the interassay coefficients for urine creatinine and urine sodium were 0.8, 2.5, 0.5, and 1%, respectively. Data on demographics and clinical outcomes were available from the ARDS studies (6,7). No data were collected on requirement of renal replacement therapy by the parent studies. The ARDS protocol did not control for fluid, diuretic, or vasopressor use. The classification of case patients and control subjects was corroborated by two blinded observers who followed the trend in serum creatinine. As the primary aim of the study was to determine that IL-18 was an early marker of AKI, we constructed data sets with demographic, clinical, and biochemical variables that were available 24, 48, and 72 h before the clinical diagnosis of AKI. For example, for analysis of IL-18 at 24 h before the event we included the levels from urines on day 0, 1 and 3 in patients who developed AKI on day 1, 2 and 4 respectively. For analysis at 48 h before the AKI event, we included the IL-18 levels from urine on days 0, 1, and 3 in patients who developed AKI on days 2, 3, and 5, respectively. The study used data and specimens that were collected as a part of the ARDS Network trials and could not be linked to the identifiable patients. The Office of Human Subjects Research granted it an exemption from requirement of review and approval by the Institutional Review Board. The study was also approved by the ARDS substudy network committee. Day 0 signifies enrollment into the ALI studies and occurred within 36 h of development of ALI. The demographic and clinical characteristics for the 138 patients on day 0 are shown on Table 1. The AKI cases had a higher number of patients with sepsis, whereas the controls had more patients with trauma as the precipitating cause of ALI. The APACHE III score and the parameters of oxygenation and tidal volume between the two groups were not different. The systolic BP was not different between the two groups. However, a higher percentage of patients required vasopressor drug support in the AKI group (53 versus 30.2%; P < 0.001). None of the patients had oliguria (urine output <400 ml/d) on day 0. Fractional excretion of sodium (FeNa) was comparable in AKI case patients versus control subjects. Survival at 28 and 180 d was significantly lower in AKI case patients as compared with control patients. Urine IL-18 values (pg/ml) were significantly higher in AKI case patients as compared with control patients at 24 and 48 h before the AKI event. The median (interdecile range) urine IL-18 values were 104 (0 to 955) and 217 (0 to 1341) in case patients as compared with 0 (0 to 173) and 0 (0 to 395) in control patients at 24 and 48 h, respectively (Figure 1). At 72 h before the AKI event, the IL-18 values were comparable in case patients and control subjects. The pattern of the results was unchanged whether urine IL-18 was expressed as pg/ml or as pg/mg creatinine. Median (interdecile range) urine IL-18 levels in control patients with or without sepsis on day 0 were not significantly different (11 [0 to 454] versus 0 [0 to 208]; P = 0.55). Similarly, the median urine IL-18 levels in AKI case patients with or without sepsis on day 0 were not significantly different (257 [0 to 602] versus 76 [0 to 856]; P = 0.55). Multivariable analyses for predicting AKI were performed separately with data that were available 24 and 48 h before the clinical diagnosis of AKI. After multivariable analysis and combining AKI case patients with corresponding control patients on those days, urine IL-18 values 24 h before the development of AKI were highly significant in predicting the development of AKI after adjustment for baseline and clinical characteristics such as sepsis, APACHE III, and corresponding serum creatinine and urine output levels 24 h before diagnosis (Table 2). 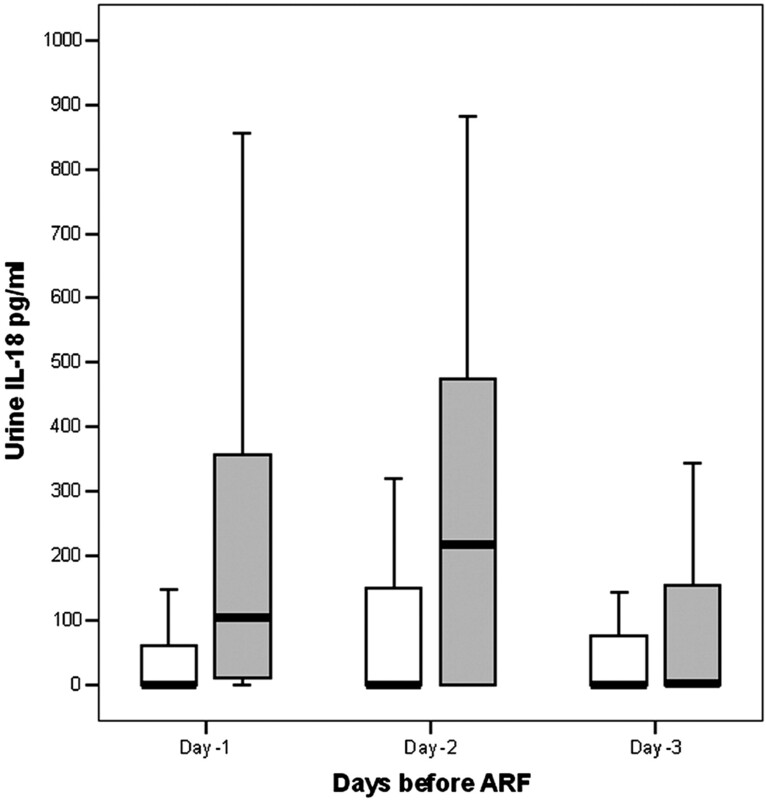 The presence of sepsis itself did not predict development of AKI in the study patients. The APACHE III score on day 0 was also independently predictive of development of AKI after 24 h. The adjusted OR for different cutoff levels of IL-18 ranged from 3.2 to 8.8. Thus, for example, the urine IL-18 value >100 pg/ml is associated with a 6.5-fold increased odds of developing AKI in the next 24 h (P = 0.0009). Urine IL-18 was significantly associated with the development of AKI after 48 h and adjustment for other clinical parameters as discussed in the above analysis (Table 3). However, the adjusted OR for different urine IL-18 cutoff values ranged from 2.3 to 3.7, with 2.8-fold odds of developing ARF at IL-18 levels >100 pg/ml after 48 h. Multivariable analysis for predicting AKI 72 h before the clinical diagnosis of AKI did not reveal urine IL-18 to be significant (data not shown). The area under the ROC curve for the urine IL-18 test is 73%, demonstrating a good performance for the diagnosis of AKI within the next 24 h. The performance of the ROC curve for the early diagnosis of AKI before 48 h was 65% (Figure 2). 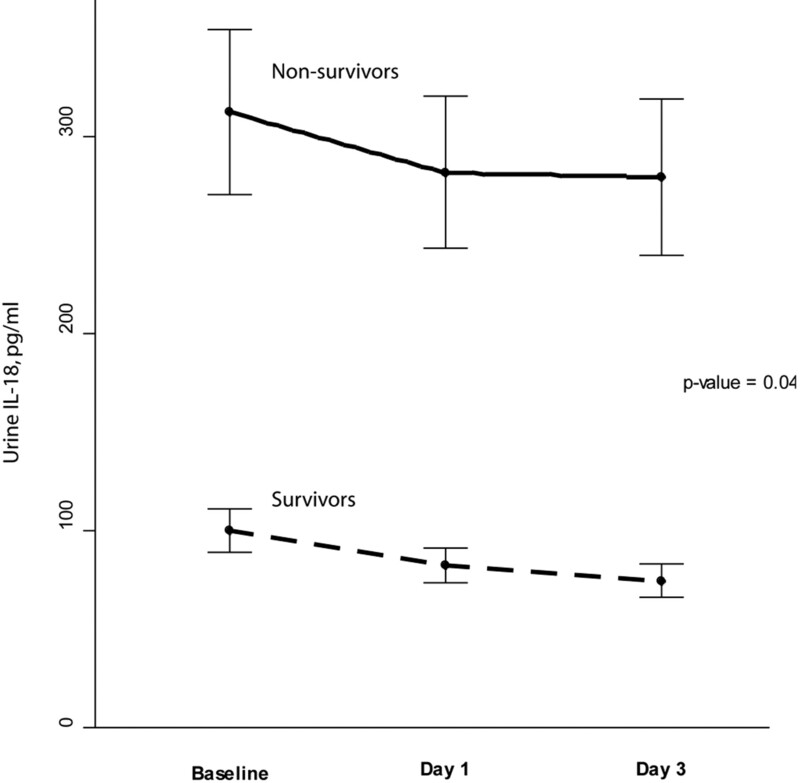 Figure 3 shows the clear and significant separation of survivors and nonsurvivors at 28 d on the basis of the urine IL-18 values on days 0, 1, and 3 (P = 0.04). The Cox proportional hazards analysis for predicting time to death demonstrates that the urine IL-18 value on day 0 is the strongest predictor of death in the ICU after adjustment for APACHE III score and other baseline and clinical parameters. A urine IL-18 value >100 pg/ml on day 0 (initiation of mechanical ventilation) increases the odds of death by 1.6-fold (Table 4). The clinical variables that were predictive of mortality in the previous ARDS trial were included in the multivariable analysis of our study. Serum creatinine was also included in the analysis to adjust for renal function on the day of urine collection. Serum creatinine, although used routinely in clinical practice and in clinical trials, is a poor marker of renal dysfunction. Unlike serum troponin in myocardial infarction, an increase in serum creatinine is not directly related to tubular injury in AKI but is the effect of loss of filtration function that occurs with AKI. There is also a delay in the detectable increase in serum creatinine as a result of the time required for its accumulation and equilibration. Changes in creatinine can be nonspecific as they may occur as a result of several nonrenal factors, such as muscle mass and nutrition (1). In contrast to creatinine, IL-18 is a proinflammatory cytokine that is released in response to injury to the renal tubules. On the basis of our mouse and human studies, this study extends the role of IL-18 in urine as an early diagnostic marker of AKI (3,4). Because of the vital importance of earlier targeting of therapies, many markers have been explored for early diagnosis of AKI. Although the initial studies on some molecules such as tubular enzymes, growth factors, adhesion molecules, and some cytokines (11–16) were promising, the larger and more detailed studies have shown inadequate sensitivity or specificity to advocate clinical use. Recently described molecules such as kidney injury molecule-1, cystein-rich protein 61, neutrophil gelatinase-associated lipocalin, and sodium/hydrogen exchanger isoform 3 have demonstrated compelling results as markers of AKI at the preclinical level (11–16). However, none of these molecules except lipocalin has been systematically explored in human AKI. In a recent study, it was demonstrated that neutrophil gelatinase-associated lipocalin in the urine increases in pediatric patients after cardiac surgery before the increase in serum creatinine (17). However, the study did not comment on the severity or outcomes of AKI in these children. It has also been reported that serum cystatin C seems to increase 24 to 48 h before creatinine in patients with AKI. However, cystatin C is a marker of clearance and not a marker of renal tubular injury (18). Over and above being a marker of renal tubular injury, urine IL-18 is an attractive test for further development as it is fast, reliable, accurate, and inexpensive. As compared with other markers, IL-18 has the advantage that it can be readily measured by commercially available ELISA kits. Availability of commercial kits can considerably hasten the development of the test for routine clinical use. The ARDS Network study did not collect information on urine analysis, fluid administration, and dialysis requirement. Thus, precise diagnosis of prerenal versus ischemic acute tubular necrosis cannot be made in our study. However, all of the patients were in the ICU, with >80% of them having at least two-organ failure and very high APACHE scores and >50% requiring vasopressors, which makes the cause of ARF less likely to be prerenal. To confirm this, we obtained serial creatinines from the ARDS Network on these patients, which demonstrated that most of the patients with ARF had a progressive and irreversible increase in creatinine with maximum creatinine that was several-fold higher than their baseline on day 0. Several studies have shown that circulating levels of pro- or anti-inflammatory cytokines correlate with prognosis of sepsis and the development of multiorgan failure (19–23). For example, increases in serum concentrations of IL-6, IL-8, IL-10, TNF-α, and IL-18 all are associated with poor outcome in sepsis and predict multiorgan dysfunction (19–25). There are, however, important distinctions between our study and the published literature on cytokines in critically ill patients. First, in most studies, these cytokines have been studied in serum or plasma. The measurement of these cytokines in urine has not been performed to assess and validate their prognostic role in a critical care setting. In our study, the presence of cytokines in the urine may offer a simpler and easier alternative to the serum measurements. Second, many of these studies are performed in the presence of sepsis, thereby limiting the role of the test in other critical care settings. Our study had a broad spectrum of cases with surgical and medical comorbidities. Also, as discussed in Results, there was no significant effect of sepsis on urine IL-18 levels in AKI case or control patients. Third, the studies measured cytokines at different time points during the course of illness. Thus, the results of association with mortality are conflicting between these studies. This study correlated the independent association of urine IL-18 with mortality at initiation of mechanical ventilation after diagnosis of ARDS, which is a relatively well-defined point in the clinical course of critically ill patients. There are some limitations to our study. First, we demonstrated previously that urine IL-18 is a marker of tubular injury and is not elevated in cases of prerenal azotemia. Although the rise of creatinine was progressive and irreversible in the majority of cases, it is possible that there may have been a few cases of prerenal azotemia as the cause of AKI in our study. However, cases of prerenal AKI would “dilute” the association between urine IL-18 and AKI; thus, the reported results are conservative estimates of the association. Second, there may be a systemic production of IL-18 as suggested by some authors (25). However, the lack of an effect of sepsis on urine IL-18 and very low concentrations of IL-18 in control subjects with sepsis argues against a major systemic contribution of IL-18 production and confirms that kidneys may be the major source of IL-18 production. Third, although we tried to exclude AKI on day 0 by choosing a strict cutoff of serum creatinine of 1.2 mg/dl, there may be a few case patients who had mild ARF in the study population and had low baseline serum creatinine. Also, exclusion of patients with a serum creatinine of >1.2 mg/dl may have excluded patients with ARF or chronic renal failure. Future prospective studies that examine whether urinary IL-18 is a marker of AKI in patients with chronic kidney disease will be interesting and worthwhile. Fourth, the results of IL-18 as an independent predictor of mortality should be interpreted in the context of the inclusion and exclusion criteria of the original ARDS study and this substudy. In summary, we have demonstrated that urine IL-18 is a reliable test for early diagnosis of AKI in critically ill patients. 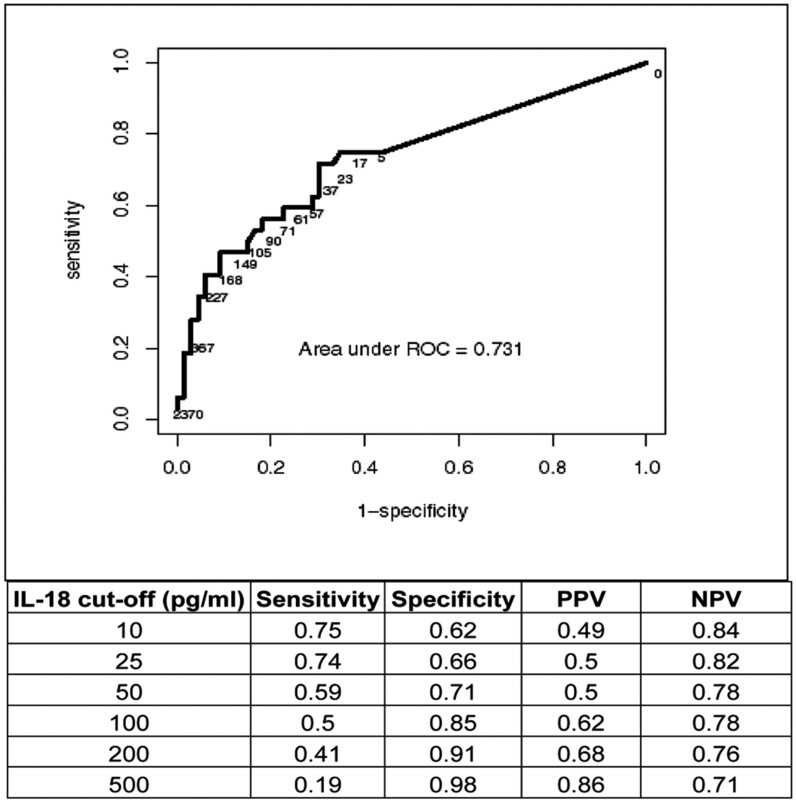 The role of urine IL-18 in predicting mortality at the time of mechanical ventilation has important clinical applications. Future clinical trials and prospective studies in AKI should incorporate urine IL-18 measurements to hasten the clinical development of this test. The study was supported by National Institutes of Health grants K23-DK064689 (to C.R.P.) and RO1-DK56851 (to C.L.E.) and by contracts NO1-HR4054 through 46064 with the National Institutes of Health, National Heart, Lung, and Blood Institute ARDS Clinical Network. C.R.P. and C.L.E. are co-inventors on a pending patent filed by University of Colorado Health Sciences Center for use of IL-18 protein for diagnosis and treatment of acute renal failure. We are indebted to the ARDS Study Group, who assembled the database and specimen repository used here, and to the patients who took part in the study. Participants in the National Heart, Lung, and Blood Institute ARDS Clinical Trials Network were as follows: Investigators (principal investigators are marked with an asterisk): Cleveland Clinic Foundation: H.P. Wiedemann,* A.C. Arroliga, C.J. Fisher Jr, J.J. Komara Jr, P. Periz-Trepichio; Denver Health Medical Center: P.E. Parsons; Denver Veterans Affairs Medical Center: C. Welsh; Duke University Medical Center: W.J. Fulkerson Jr,* N. MacIntyre, L. Mallatratt, M. Sebastian, J. Davies, E. Van Dyne, J. Govert; Johns Hopkins Bayview Medical Center: J. Sevransky, S. Murray; Johns Hopkins Hospital: R.G. Brower, D. Thompson, H.E. Fessler, S. Murray; LDS Hospital: A.H. Morris,* T. Clemmer, R. Davis, J. Orme Jr, L. Weaver, C. Grissom, F. Thomas, M. Gleich (deceased); McKay-Dee Hospital: C. Lawton, J. D'Hulst; MetroHealth Medical Center of Cleveland: J.R. Peerless, C. Smith; San Francisco General Hospital Medical Center: R. Kallet, J.M. Luce; Thomas Jefferson University Hospital: J. Gottlieb, P. Park, A. Girod, L. Yannarell; University of California, San Francisco: M.A. Matthay,* M.D. Eisner, J. Luce, B. Daniel, T.J. Nuckton; University of Colorado Health Sciences Center: E. Abraham,* F. Piedalue, R. Jagusch, P. Miller, R. McIntyre, K.E. Greene; University of Maryland: H.J. Silverman,* C. Shanholtz, W. Corral; University of Michigan: G.B. Toews,* D. Arnoldi, R.H. Bartlett, R. Dechert, C. Watts; University of Pennsylvania: P.N. Lanken,* J.D. Christie, B. Finkel, B.D. Fuchs, C.W. Hanson III, P.M. Reilly, M.B. Shapiro; University of Utah Hospital: R. Barton, M. Mone; University of Washington/Harborview Medical Center: L.D. Hudson,* G. Carter, C.L. Cooper, A. Hiemstra, R.V. Maier, K.P. Steinberg, M. Neff, P. Berry-Bell; Utah Valley Regional Medical Center: T. Hill, P. Thaut; Vanderbilt University: A.P. Wheeler,* G. Bernard,* B. Christman, S. Bozeman, T. Swope, L.B. Ware; Clinical Coordinating Center, Massachusetts General Hospital, Harvard Medical School: D.A. Schoenfeld,* B.T. Thompson, M. Ancukiewicz, D. Hayden, MA, F. Molay, N. Ringwood, C. Oldmixon, A. Korpak, R. Morse; National Heart, Lung, and Blood Institute Staff: D.B. Gail, A. Harabin,* P. Lew, M. Waclawiw;* Steering Committee: G.R. Bernard (chair); Data and Safety Monitoring Board: R.G. Spragg (chair), J. Boyett, J. Kelley, K. Leeper, M. Gray Secundy, A.S. Slutsky, B. Turnbull; Protocol Review Committee: J.G.N. Garcia (chair), S.S. Emerson, S.K. Pingleton, MD Shasby, W.J. Sibbald.